I came over to Fremont around 3 PM today to pay for the repairs to my minivan. It rained quite a bit this morning, then cleared for a while. As I pulled up to park near my mechanic's shop, I had the odd situation of seeing it rain fairly heavily directly in front of me, and not at all behind me. With the patchy conditions, the situation was picture-perfect. 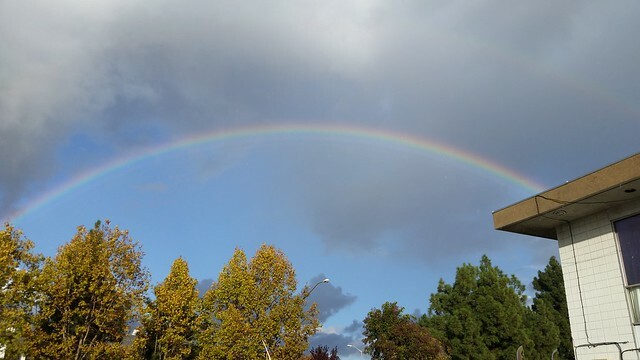 This rainbow stretched over Fremont. I hope it's a sign that we'll get lots more rain, regularly, all this season. And lots of snow in the Sierra. Things are so far behind that I think we need two super-wet seasons to have any hope of making a dent in the backlog. I paid for the work on my minivan. Cory-my-mechanic told me that he's prospectively ordered parts for a repair to my driver's side door, which I know needs fixing. We'll work out arrangements with him again sometime. I also plan to, when finances permit, have him replace the rear springs in the Rolling Stone and also redo the brakes. Maybe in January, assuming all goes well.